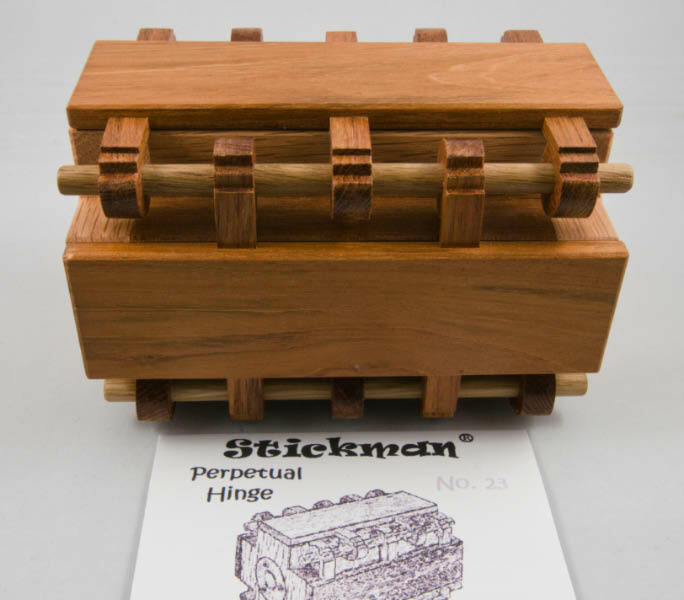 My third Stickman acquisition was a Perpetual Hinge Box – also off the Australian Relief Puzzle Auction, so the money went to a great cause thanks to the generosity of one R. Yarger who not only donated the box, but also paid for the shipping across the pond. So, attack this thing logically, examine all the panels individually, fiddle with the disks and generally play around with it for a while until you notice that one of the panels will slide up or down a bit – A-HA! Gotcha! ... So you explore that for a while and get a few of the other panels sliding around – oddly sometimes they seem to interfere, and sometimes they don’t … so you fiddle some more. … Right, so at this point I put on my specs and engage the brain and start crawling over it with a fine-tooth comb, and start examining the stuff I’ve ‘overlooked’ [more accurately, not paid nearly enough attention to] up to now, and then spot a couple of interesting little features, features that have been so cunningly hidden that Robert deserves a medal! Armed with that little insight, you can now form a more useful strategy and open the first compartment … which leads you to a really interesting discovery of what those disks might just be doing – you can see some really funky things going on in there that still don’t really make sense (or more accurately – they didn’t to me!). A bit more work opens the next section and shows you the guts of the box – all those weird movements finally make sense and I’m left with an overwhelming sense that if he’d been a nasty man, Robert could have made that mechanism do a bit more and made it a heck of a lot harder to open – thanks for stopping where you did, mate! It really looks great, but you’re going to have to trust me because the only pictures I’m going to post are going to be of the outside – you need to earn a view of the insides of this beauty! When they were first launched, a couple of different coloured sleeves were available, with the colour of the maze core being represented by the colour of the ‘R’ logo on the end of each core…these days all of the cores (in this style) are black – so pay attention to the colour of the sticker or you won’t know which maze you’re working on. 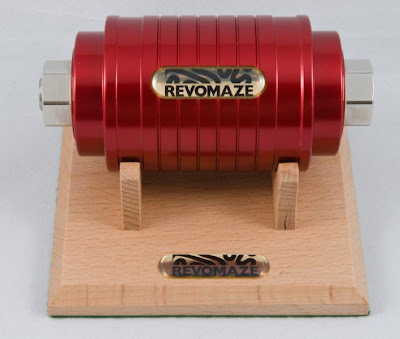 Commercially it makes a lot of sense to have the cheaper versions available – and having Extremes available for more serious puzzlers (or hoarders like myself) covers both ends of the market. 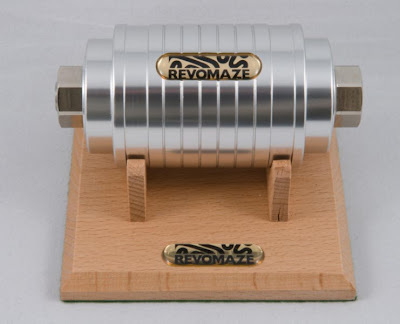 There’s a lovely story behind this Revomaze – it doesn’t form part of the main series of puzzles and was only issued in a limited edition of 20 puzzles. The story goes that one of the engineers who manufactures bits of these puzzles was chatting to Chris (the designer / MD of Revomaze) and came to realise that Chris would never experience the pleasure of getting to solve one of these puzzles, since he always knew what the maze would look like… he also recognised that up until then (Blue and Green time frames) Chris had stuck to orthogonal mazes … so he issued a challenge to Chris to solve a maze that he’d create specially for him … and thus the first Revomaze Black was born. 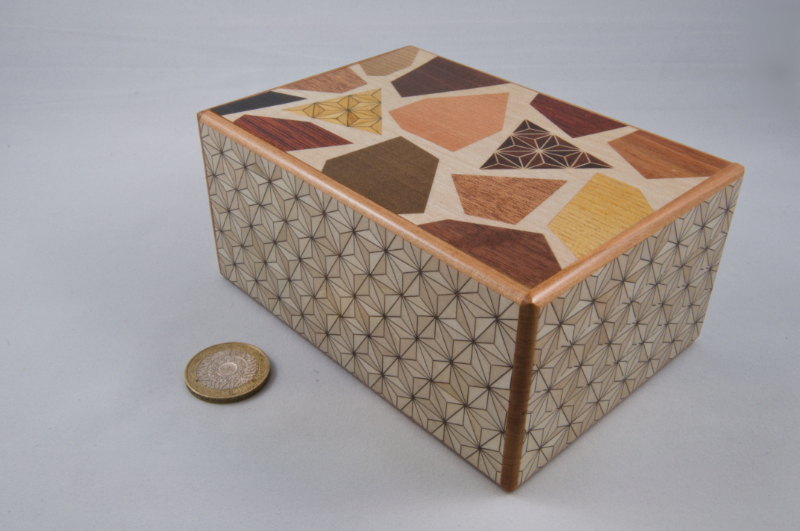 Recognising that this was too good a puzzle not to release to the puzzling public, Chris commissioned a limited run of 20 available on a first come first served basis. 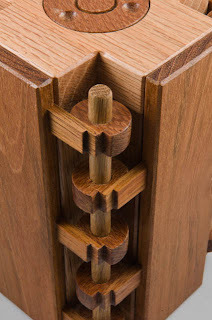 This is another unusual looking burr (perhaps better described as a kumiki-style puzzle) in the shape of the Sears Tower. This puzzle a unique 'Brian Young-style' locking mechanism that needs to be defeated before you can start disassembly. The burr has a couple of brass radio masts sticking out of the top of the building and you’ll quickly notice that they can be unscrewed – this may loosen things up a bit, but that first lock I was referring to still needs defeating! The lock uses a trick that Brian’s used on a couple of other designs as well, but this time it’s hidden in the bowels o’ the burr, so working out what it is, and exactly how to get past it, is best described as “non-trivial” – I’m going to say that because it took me quite a while to work it out! It’s a nice self-contained little puzzle and once you’ve defeated the locking mechanism, the rest of the disassembly is reasonably straight-forward – and reassembly is a lot simpler once you’ve seen the first piece come out! Sydney Harburr Bridge was Paul McDermott’s IPP exchange gift at the 2007 IPP. 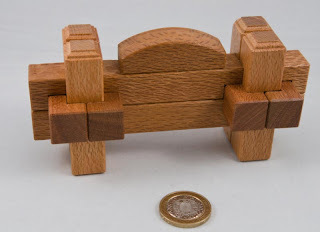 The puzzle was made by Paul and Brian Young (aka Mr Puzzle) and I think it’s inspired as an exchange puzzle for the Gold Coast IPP – the overall shape is absolutely representative of the iconic Sydney bridge, and the detailing on the puzzle is unmistakeably Brian’s. As a puzzle, it’s a combination of a pair of burrs sharing two bars in common – the ones that form the span of the bridge. As Brian’s burrs go, they’re reasonably straight-forward. (Heaven alone knows how this thing would have turned out if he’d tried to put a Mega-Six on each end … I’m not sure that would work given the interference necessary … but if it did, I suspect that very few of them would ever be reassembled!) The only real complication is the need to build a couple of mirrored burrs concurrently so that they both end up locking together at the same time. I really like the look of it – it’s unusual and ‘not just a burr’ - the silky oak it’s made from is also quite striking – it’s not likely to keep you awake at night trying to solve it, but think it’s a nice addition to any puzzle collection. Brian still has them for sale over at Mr Puzzle if you’re interested. As I alluded in my Revomaze mapping notes, I got to know the first part of my Bronze very, very well. I perfected my mapping techniques and gave myself very sore hands for several months while I worked out what the heck was going on in there. Bronze has a couple of nifty little tricks to slow you down, like an area dubbed the ‘swimming pool’ that takes a little thought to work out how to get out of out of it and back to the main area of the puzzle. [This is the first time that you find yourself evidently trapped in the puzzle with no obvious means of resetting … and it can be a bit unsettling at first.] It also throws a few non-orthogonal paths and curves at you … and if you’ve perfected a technique for mapping that relies on straight lines, and ninety degree corners, that can be a bit disappointing! OK, so following the usual strategy of exploring and mapping everything, leaves you locked in the first quarter of the maze … getting out requires new thought and I found that staring at an accurate map of what you do know, to be about the only strategy … that and occasionally trying crackpot theories that come to you in the middle of the night. During the course of those experiments, I managed to break the maze … yip break it … in fact I moved an entire wall a mill or two right, effectively blocking the corridor on the other side of it … having established that I’d gubbed it (good Glasgow word that!) courtesy of a mate on the Revomaze forum, I confessed to the manufacturer and sent it off to him for repairs – he promptly sent me a replacement, for free, even though I’d unquestionably broken his creation … that made me feel really bad. 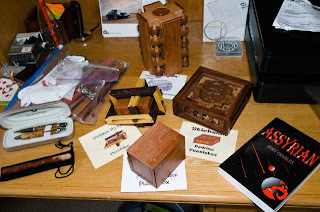 About half an hour after receiving the new puzzle, I’d opened it – I’d worked it all out, but my enthusiasm (and yes, it must have been rather extreme to have wrought damage like that in there – I’ve seen the pictures! 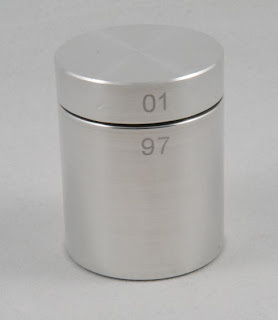 – It’s a bronze shaft, milled and then nickel-plated, and I moved a wall!!) had stopped me from getting out … a really good puzzle – the progression on this one will really open your mind. 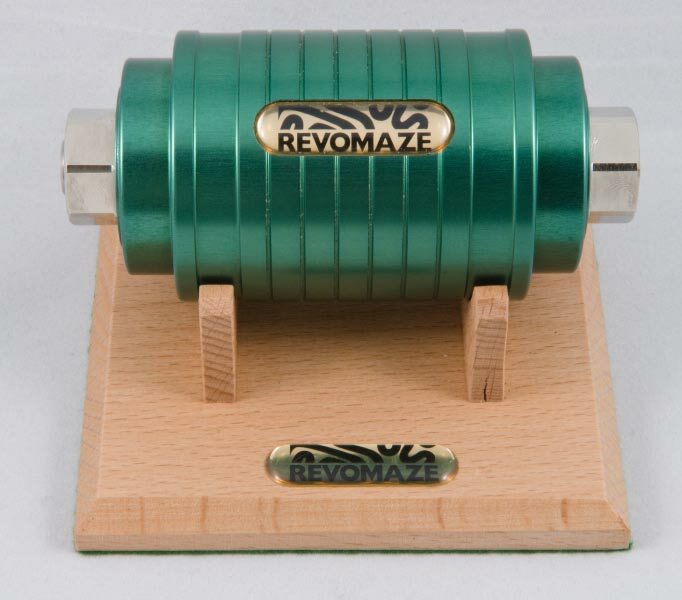 Green is the second in the series of Revomaze Extreme puzzles. On the outside, apart from the colour of the sleeve, there’s no difference at all from the Blue … inside, that’s not quite true. The Blue is a reasonably straight-forward maze, you always know when you’ve done something wrong, and resetting back to the start of the maze becomes second nature. In the early versions of the Instruction cards there was a subtle difference between the one that came with the Blue and the one that accompanied the Green. Basically the Blue instructions said that when you hear the click, you’re in a trap and you need to reset the puzzle; whereas the Green changed that to you may be in a trap. That turns out to be a pretty important little clue or realisation. Having spent some time working your way through the Blue, you get conditioned into resetting whenever it goes click, but doing that on the Green, effectively traps you in the first quarter of the maze, forever … and working out how to get out of there requires a lot of really fine observation skills, or a reasonably decent ability to map what the maze looks like. While you can get away with not actually drawing a map of the Blue, you’d need to draw a map of at least part of the Green to work out how to defeat its new trick. Once you’ve worked out what you need to do form your picture, a reasonably steady hand should see you through to the second half of the puzzle, and that’s pretty straight-forward. Once again, getting the two dots to line up and releasing the pins opens the puzzle and gives you the second part of the Series Code map and a certificate from the maker. Having solved the Green, you realise that there’s a definitive progression to this series of puzzles: Blue introduces the concepts and teaches you that you can’t always simply follow a wall in a maze. Green builds on that and teaches you the importance of space, and negative space, and how useful maps can be. I suspect that if you ask 5 puzzlers who’ve solved these things whether and how to map a puzzle, you’ll get six answers. These are my thoughts; I’ve found the methods useful, if you find it useful, great, if you don’t, also great – as long as you enjoy the puzzles! Mapping in your head – i.e. relying on (muscle) memory for everything will be fine for the Blue and many people swear by it … it does need a bit of visualisation and a decent memory, but it’s certainly feasible. 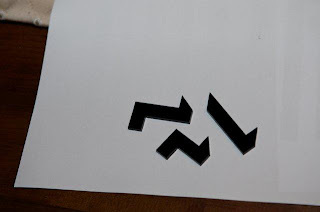 Scribbling notes – my method for Blue involved a list of arrows in various directions representing moves, annotated with notes (“beware right, there be dragons!” or “ease around corner to left”) – it worked OK, but quickly falls flat on the Green. Freehand maps – using some sort of colour coding for walls, paths and traps – this is quite effective and will probably be good enough for most of the series, as long as you pay careful attention to some areas and map them fairly accurately relatives to markings on the sleeve and the core (the core has a serial number engraved on it which can provide a handy depth reference). Measured mapping – I started drawing pretty accurate maps from the Bronze puzzle – mainly to make sure that I wasn’t missing something obvious – this involves measuring depth of the core in / out of the sleeve (using a calliper in my case) and accurately measuring rotation of core relative to the sleeve – I use a bit of masking tape around the end of the core (actually on a trainer handle, if you have one) marked in millimetres as a measure of rotation – then drawing what you can ‘see’ on graph paper. Once you’ve solved one of them, you know how big the maze-universe can be and that gives you clues as to where you should look to go next, sometimes. 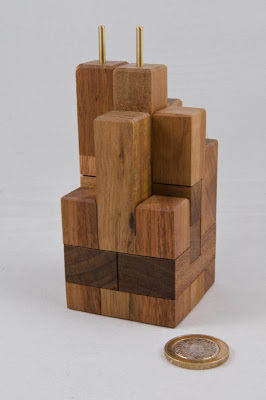 This is a brilliant puzzle – I can’t honestly remember where I first stumbled across these puzzles, but it must have been somewhere in the course of my surf-err-research on the inter-web…somewhere, someone had said they liked the puzzle, so I had a look at their website and it looked intriguing. Physically it’s a nice looking puzzle – the sleeve is machined aluminium anodized blue and the core is nickel-plated – these puzzles mean business, weighing the best part of three quarters of a kilo (look it up, it’s a measure of mass!) – don’t drop them on your toe…you’ve been warned. 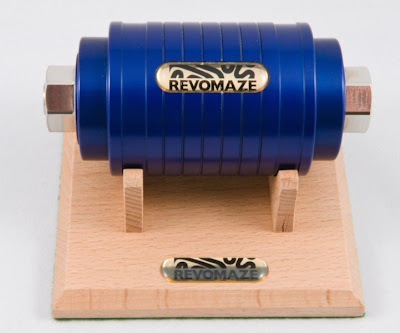 The premise is simple – there’s amaze inscribed on the shaft inside the blue sleeve. There’s a sprung pin inside the sleeve that engages the maze. Navigate the pin through the maze to the end – when a dot in the shaft is exposed and lined up with a dot on the sleeve. Mazes are simple – left hand on the wall, follow to end – simple! Well, not really – there’s a clue in the fact that the pin is sprung. The maze has tracks at differing levels, so falling off a track into a trap sends you back to the start again – and that spring makes sure that if you don’t follow the correct path, you will fall into a trap, every time! Now at this point I should probably admit that starting this puzzle properly took me a couple of weeks, and I only really got my head around the first problem after I’d lent it to a mate and he showed me something important…engaging the maze is simple: rotate shaft anti-clockwise until it goes tighter (the pin is climbing up a ramp in the start ring) and then push the shaft outwards – first move complete, you’re in the maze … from there there’s only one way to go, so you follow the path … only to find the first trap – CLICK as the pin drops into the trap trench – the shaft feels a bit looser, and from there the only way out is back to the start ring. I’d done that a hundred times before I took it into the office and let Andy (he of the mini Japanese puzzle box-fame) play around with it. He showed me that after the first few bends, you had to be really careful when you went around the next corner, slamming it from one corner to the next will simply drop you in a trap, but if your finesse it around that particular corner, you don’t fall into the trap … that was the breakthrough that I needed – get yourself out of the mind-set that blind mazes like this are simple two dimensional maps wrapped around a cylindrical core – you can’t just follow a wall and find the end (and boy is that true at one particular spot in the this puzzle!). You need to map out (in your mind, or on paper if you’re like me) all that you can ‘see’ in there and work out a strategy for getting all the way through the maze to get the shaft out … trust me, once you see the two little dots lined up, release the pins and take the core out exposing the maze for the first time, you will love this puzzle. Seeing the maze cut into the core and understanding what it is you’ve been feeling through the pin all the way around is absolutely tremendous – it’s really beautiful to see the machining in there and appreciate how fine the tolerances really are for all that to work … once you open the puzzle there’s a hidden compartment inside the shaft that contains a unique certificate (so you can prove that you’ve opened it) and part of a maze printed on acetate – which will form one part of a 5-part map providing a series code – first person to crack the series code wins a cash prize (around £5000 at the moment). Blue is the first in the series … followed by Green, Bronze, Silver and (still to be released) Gold. Gesicht (or Face, if you’re Anglish) looks a bit like a stylised face – there are two holes for eyes, beneath which is a mouth with a tongue sticking out and then a series of slots and holes outlining most of he way from one eye around the sides to the other eye…there’s a ball bearing inside the puzzle and a little rod with different sized balls on each end. The ‘maze’ is a pretty simple, straight route, with the only complicating factor being a couple of plastic speed bumps inside the ‘maze’ that mean the ball needs to be encouraged past the bump with the aid of the little rod….so far so good – there are a couple of spots where you need to think a bit about which way up you need to get you rod so that you can do what you want and still be able to retrieve it again, again, so far, so good. A bit of searching around the inter-web confirms suspicions that the object would appear to be to get the ball from one eye, around to the other and then back again. All well and good, until you get to one particular final little part of the journey, where you brain tells you that it’s impossible (hook! ), so you try getting creative (line!) and then realise that it won’t work (and sinker!). Roger D is an enigmatic German (?) 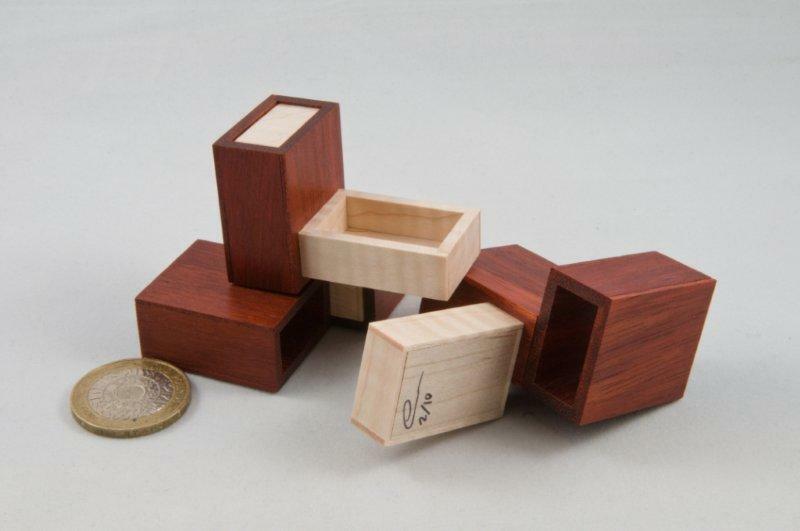 manufacturer and creator of a number of unique, instantly recognisable puzzles. They only ever appear in small quantities and the usual shops tend to sporadically have a few of them in stock and sell out fairly quickly. When they appear on auctions they’re invariably hunted down while their prices are chased up by collectors wanting to add to their hoards. Roger is by all accounts a bit of a mystery, even to some of those who sell his products, with several of them dealing through middlemen who refuse to allow any direct contact with the man himself. One anecdotal story involves a series of communications backwards and forwards through a middleman about a particularly nice puzzle, enquiring about possibly stocking it regularly, pricing and such, until the vendor asked for about thirty puzzles to stock-up, at which point all communications ceased … moral of the story: if you like Roger puzzles, and you can find one or two, buy them! There’s no telling when you’re likely to find them available again. 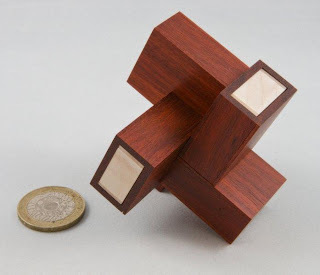 A huge part of their charm is that they don’t come with any instructions – or solutions, so the first challenge is usually working out what the object of the puzzle is, and sometimes that’s far from obvious. Schleussel was the first Roger D puzzle I stumbled across – at the time I didn’t even realise it was a Roger – I just bought it from Grand Illusions as a fun puzzle lock. I’ve done a lot of surfing, err, research, since then so I’d like to think that I’m more likely to recognise a Roger puzzle these days, FWIW. 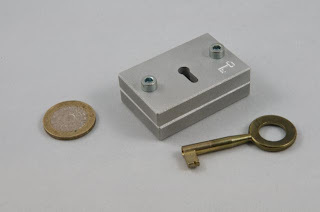 Schleussel, or ‘Key’ if you’re Anglo-ish is a pretty simple looking lock and key, so your first assumption is (OK mine was!) it’s some form of puzzle lock, put the key in the lock and turn (‘cos that’s what you do when faced with a lock and a key, isn’t it?) – things go well at first, it turns almost a full turn before stopping … OK, so what’s the next thing you do? Turn it back, yeah? … right about now, you realise that Roger’s backed you into a corner and you’re stuck there – damn key won’t budge – so now you know, the puzzle isn’t putting the key in, that’s easy, it’s not turning the key, that’s also easy, it’s getting the damn key back out again – ‘cos it’s stuck in there now! A bit of fiddling will generally get it back a bit, but as with good puzzles, one slip up and you’re back to the start again – except that in this case, the start has the key firmly locked in place at the extreme of its travel. Not helpful … but nice for a puzzle! Without giving too much away, my first solution wasn’t particularly elegant, but it worked, was repeatable and didn’t take very long – but it looked like a kludge … several months later I was thinking about the mechanism and wondered to myself if there might be a far more elegant solution, and indeed there is: it opens in seconds, every time, with one smooth movement … now I think I’ve solved it properly. I’ve always had a bit of a soft spot for puzzle bottles, so when I found a couple of interesting looking 250 ml Coke bottles on Sloyd’s web site, it didn’t take long to order one. 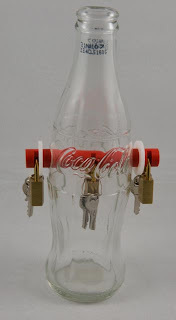 This one looks a little daunting at first: there’s a solid bar through the middle of the bottle with three padlocks fastened to it – each with a key or two hanging from the locked shackle … so far so good … the bother comes largely from the fact that the keys on the outside belong to the lock on the inside, and vice versa … usual rules apply – use what you have in front of you, only! 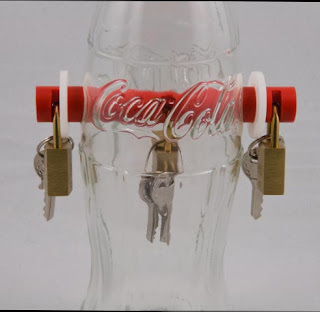 Helpfully you’re instructed that the aim of the puzzle is to remove and replace the two white rings currently between the outside of the bottle and the two outer padlocks … i.e. dismantle and reassemble the entire thing … no short-cuts! It’s another nice, honest puzzle … it uses recognisable everyday objects (albeit there are a couple of holes drilled through the bottle, I don’t tend to come across those very often, but hey…) and there actually aren’t any tricks that only someone who’d seen one of them before would know about (there’s a big clue for you!). A bit fiddly, but very satisfying – the sort of puzzle that will interest puzzlers and non-puzzlers alike, because it looks like it should be impossible – always a great hook. I’ve heard of these things remaining closed for years, stubbornly resisting the attempts of desperate puzzlers to unlock their secrets – and I can easily believe that – this is not a puzzle that will ever get solved accidentally: there are four ball bearings in there, and any one of them can lock the puzzle closed. 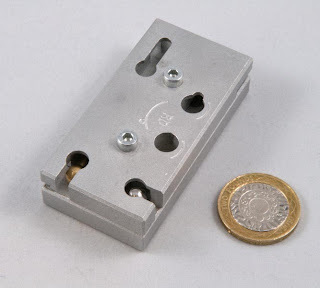 The rather cunningly designed internals also mean that an unwary puzzler will find himself locking the puzzle rather than unlocking it. Cute puzzle – get one, either from Sloyd or directly from William Strijbos. 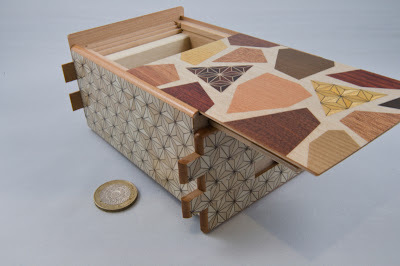 ...is a good, honest puzzle – everything’s out on display from the start: you have a three axis frame (made of yellowheart, wenge and bloodwood) around a leopard- wood box which has a maze inscribed on three sides. 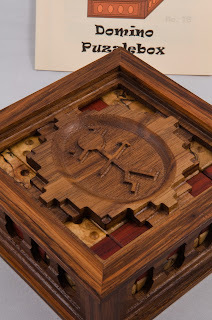 The frame has a pin engaged in each of the mazes and the axes interfere such that you need to navigate around all of the mazes in order to get the box to each of two end positions that will allow you to open a couple of drawers. The different coloured woods used in the frame and the pins really stand out and make it quite a striking puzzle to look at. The reinforcements in the corners of the frame are not only a nice looking touch, but keep the frames nice and rigid, so the travel through the maze is positive and stops any temptation to try and finesse things. Try Knot was crafted (“manufactured” just sounds wrong for beautiful pieces like this!) in a batch of 55, and this one is number 9. 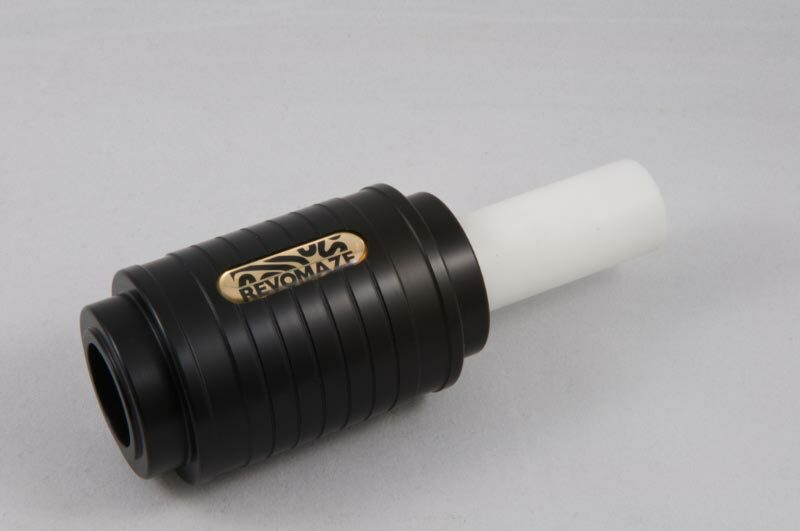 This thing is beautiful – incredibly beautiful! I’ve tried to take some pictures that do it justice and I’ve failed. The detailing on the box itself it brilliant – the Stickman on the one side and Devost logo on the other are executed superbly. The box itself is made of walnut and Monticello and the tiles are made of exotic burl. 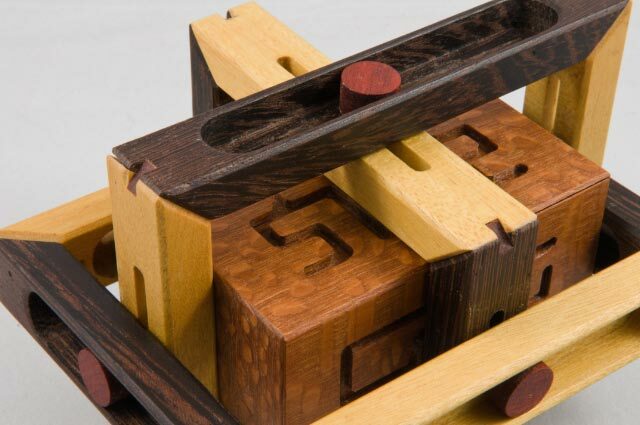 As a puzzle, it’s not conceptually that tough: it’s really a sliding tile puzzle, with three layers of tiles, most of which are made up of a set of domino tiles (yes, there’s a full set in there so you can actually play dominoes once you open the box!) and the rest are a number of different shapes to keep things interesting. Tilting the box generally slides things around until they hit something else and there are quite a few holes that you can poke your fingers through to encourage tiles to move or stop them from moving... it’s fairly clear what the goal is and where you need to move the space to in order to open the box, but some of the odd shapes can seriously hamper that – especially when some of them are hiding in the middle layer or partly obscured by the logos. 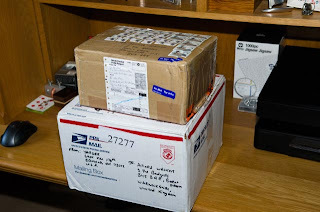 ...when I got a note from Parcelforce asking me to pay some VAT on a parcel from the USA – I’ve been tracking a parcel from the States since the beginning of last week – the result of winning a couple of lots on a puzzle auction over on Puzzle Paradise. 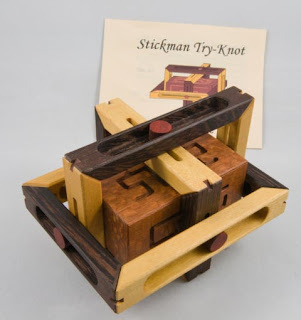 As I said, there were some pretty incredible puzzles available on the auction, and I managed to win four Stickman lots – the parcel I’d been tracking had been some boxes from Robert Yarger’s personal collection, donated to raise funds for Dave. I’d joked with one of my puzzle-mates a few months ago about not being ready to grow up yet, and that if I ever managed to acquire any Stickman boxes, I’d be forced to admit that I was probably starting to take this whole puzzle-collecting thing seriously, and that maybe I was growing up after all... (I’ll probably continue to consider myself an enthusiastic amateur though in the light of some of the real collectors out there!). So yesterday my collection of Stickman boxes went from zero to four and a half in the space of a couple of hours ... the grin didn’t leave my face all day and I spent several hours solving them one at a time so as to spread out the pleasure as much as I could, after all, the chances of being able to do that again any time soon, are probably quite slim ... what a lovely weekend. Thanks Robert and John. 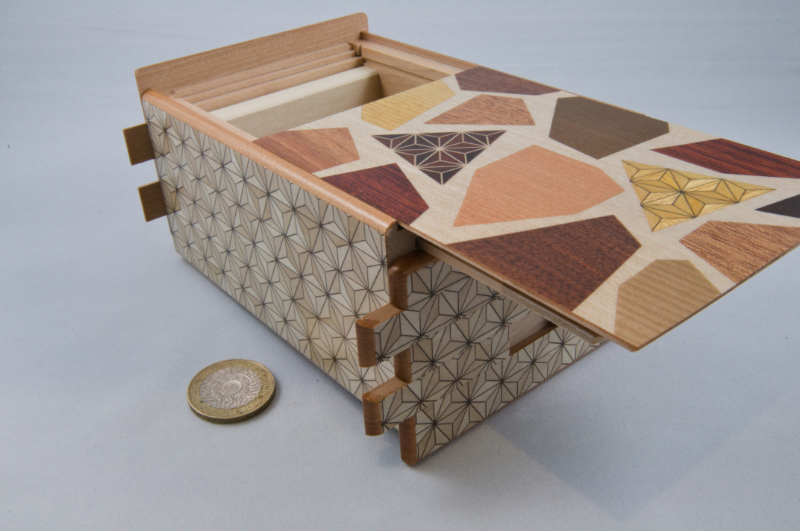 ... on limited edition handmade puzzles. I stumbled across Cubic Dissections in some of my random surfing for all things puzzling, and I liked what I saw – the stuff in the shop window was really gorgeous – handmade in small quantities by guys who clearly knew what they were doing ... only problem was, they were always sold out whenever I happened to surf on by. One day, things looked a bit different – not only was there some new stuff in the window, but it looked like there was actually some in stock, so it didn’t take long to place an order for the first of my really high quality puzzles – Oskar’s Matchboxes made by Eric Fuller, he of Cubic Dissections-fame. Designed by the legendary Oskar van Deventer (yes, he of the 17*17*17 Rubik’s cube fame! ), Oskar’s Matchboxes are a set of oddly joined drawers and sleeves, offset a bit and connected at some pretty funky angles. 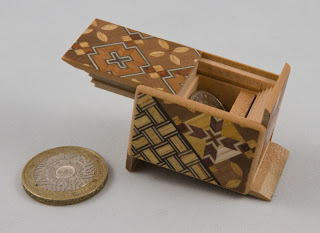 The premise is simple: assemble the bits so that all the matchboxes are closed ... when you first start fiddling with them you find that there are a lot of ways to almost solve it – everything goes together so well until you find the last piece is offset the wrong way ... start again. The craftsmanship on this puzzle is simply sublime – when you solve it, everything aligns perfectly and the fit between the drawers and the sleeves is ridiculously good – it’s clear that Eric is not only a craftsman, but a proud one. I like the fact that he signs and numbers each set – this guy really cares. 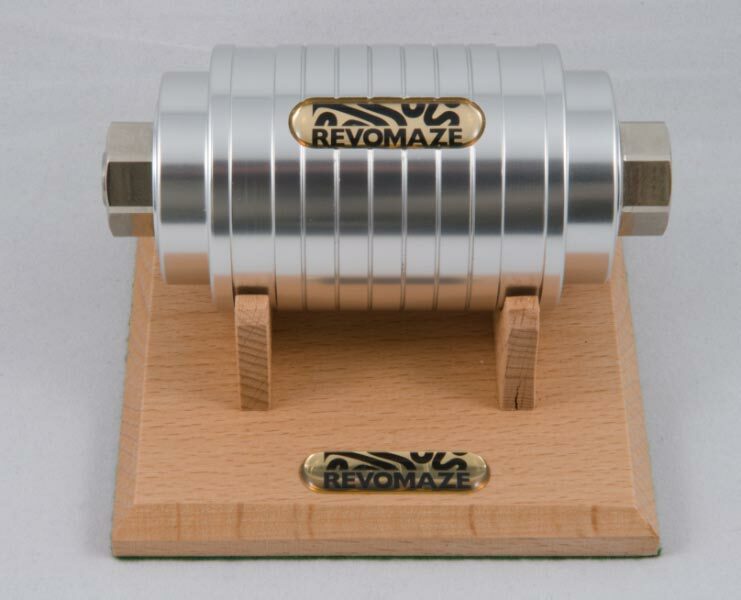 The Midlands Puzzle Party started as an idea from Nigel, all-round good guy, puzzler of note and one of the Admins on the Revomaze forum. 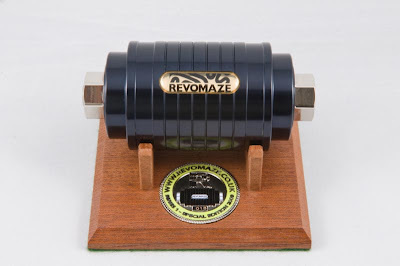 Revomaze is a series of increasingly difficult puzzles based around a seemingly simple basic concept (and I promise I’ll write more about them in the future) and the forum is pretty good place to chat about all things Revo. It has a really great community buzz to it (the occasional RRs appears, but they’re generally dispatched). 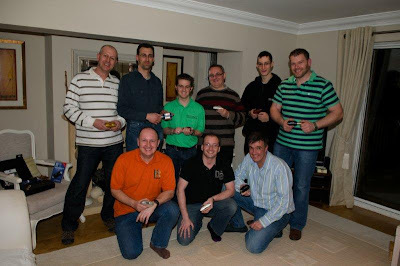 Anyhoo, we came to realise on the forum that there were quite a few of us in and around the Midlands – some of us had already met and talked puzzles, but there seemed to be another whole bunch out there, so Nigel floated the idea of an MPP to gauge the interest, and a couple of weeks later 8 people rocked up at the house with their favourite puzzles. Some came from just a couple of miles away, some drove up from London, the creator of Revomaze came down form Cumbria and Louis flew across from Holland (Serious Puzzle Nutter!). Introductions were interesting... since most of us only knew one another by our forum names (and it feels rude calling someone Paradox, KB64 or Bluesign2k to their face) – new names learnt, the puzzles were all hauled out and placed on the dining room table. I think I can safely say that my table has never seen that many superb puzzles in its life, and it’s not a young table! Soon enough everyone had a cup of something and a new puzzle in their hands ... fiddle, chat, solve, repeat – break for lunch ... fiddle, chat, solve, repeat. The range of puzzles was absolutely immense – from Nigel’s Super Cubi at the one extreme to a freebie that Oli’d been given when he bought a few puzzles at Village Games (I’ve still got to make my own pilgrimage to Village Games... and try and time it with one of their monthly puzzle get-togethers.) Everybody found several things they’d seen somewhere and hadn’t had a chance to play with yet, and everyone went away with a new mental shopping list of must-haves. What really strikes me whenever I see a collection of puzzlers is how their love of solving puzzles seems to be the only thing that’s important – age, experience, how much your puzzles cost, what you do for a living, where you live doesn’t get in the way or matter to anyone... sharing a love for puzzles and stories about them is all that counts ... and I really like that about puzzles, that they can level all those playing fields and remove the artificial hurdles that life often tosses in our way. Puzzles Rock that way! Anyway, back to the puzzles – from the sublime (Nigel’s Super Cubi – handmade Japanese puzzle box nirvana that takes 324 moves to open, and the same again to close) to the ridiculous (Sorry Oli, you knew this was coming!) 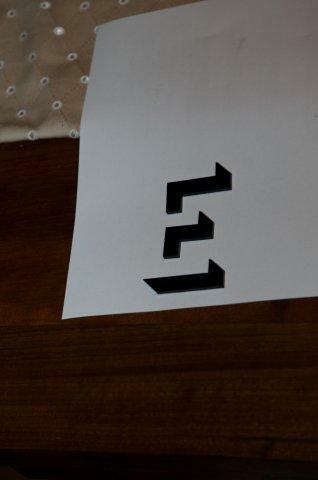 : Oli had been talking on the forum about “The Elusive ‘E’” – and he was struggling to get it solved. It’s a simple premise, three oddly shaped bits of acrylic and you have to make an ‘E’ – casual observation, and indeed many hours of Oli’s time experimenting has shown this isn’t a simple matter of trying to fit the right edges together to magically make an ‘E’ ... I’d seen the concept before and was trying to explain how to make it work to him, but clearly I wasn’t getting anywhere on the forum in fact I think I inadvertently sent him on a bit of a wild goose chase with a lamp at least once) - so at the MPP, Oli brings out the Elusive ‘E’ and there’s general puzzlement all round, I try explaining what to in words, and fail miserably, so I try drawing the solution, but that doesn’t help either, so I put the pieces into position, still nothing, and by now Oli’s frustration is almost noticeable, in fact, he says, he’s going to complain to the shop that it doesn’t look like an ‘E’ at all, so he snaps a picture of it, looks at the screen on the camera and it hits him – giving us all the biggest laugh of the day... Thanks Oli! ...well don’t take my word for it – here’s what puzzling legend and collector extraordinaire, Edward Hordern had to say about it: "If I had to give away my entire collection of locks – there must be a hundred or two hundred of them – and keep only three, this recent acquisition would be one of them. As the other two are rather nice antique ones, we need not consider them any further here. 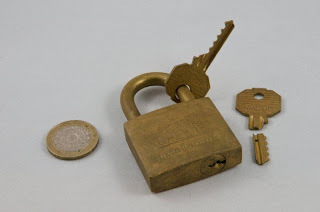 To my way of thinking, the new lock is easily the best of the modern padlocks and is called 'DanLock'". 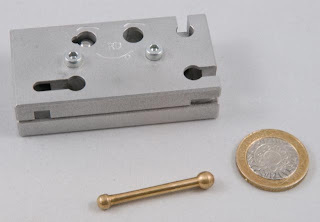 ...I remember reading that before I bought my DanLock and thinking “Well, if EH thinks it’s that good, and he’s certainly played with more than a few puzzle locks in his time, it must be pretty special”, so I bought one from Grand Illusions. The first time you take it out of the bag, you get the very strong impression that something is very wrong with this picture: you get one good, solid Israeli- made lock and two keys – bit of a problem though since one of the keys is fastened to the locked shackle and the other has been sawn in half... and your mission, should you choose to accept it (and that’s an important choice that some folks dither over for quite some time, especially given how you start this little adventure!) 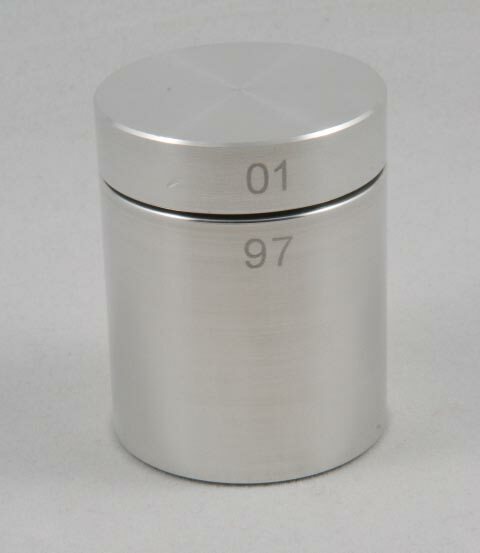 is to open the lock and then return it to the state you found it in. Good puzzles make you think, a lot. Great puzzles do that, and don’t let you do anything irreversibly harmful. This is a GREAT puzzle – EH was right on the money. ...because it means the mechanism can be more ‘interesting’ – this is a medium size traditional Japanese puzzle box that uses two sets of ‘keys’ that slide in and out to release the end panels to move in a particular order (38 of them in this case) until the top is able to slide open... there are plenty of variations on the theme, some requiring fewer moves, some requiring more, some requiring ‘unusual’ things along the way – several designed to trap the unwary puzzler who thinks he’s seen it all before (keep an eye out for a post on the Karakuri small boxes – those are an excellent lesson in misdirection and catching the unwitting puzzler totally off-guard!). 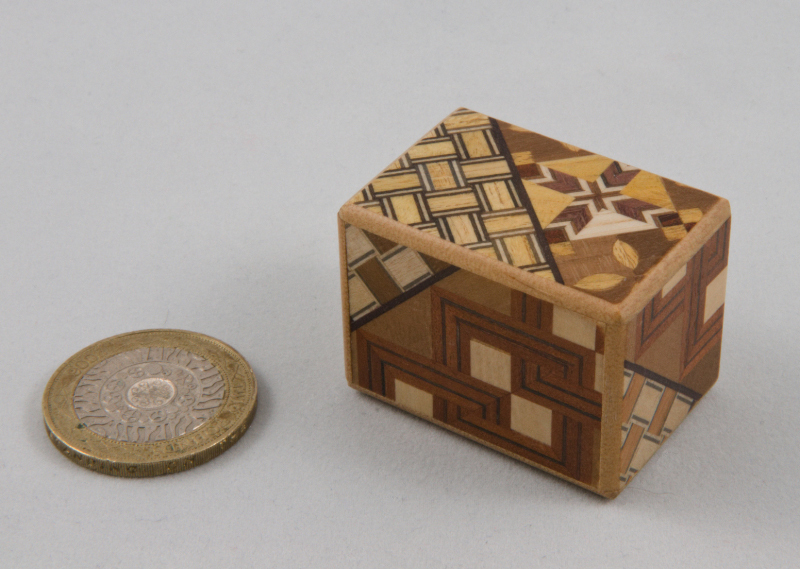 Japanese Puzzle boxes, that is...this was my first one – it’s tiny – that’s a two pound coin for reference, so it’s only about an inch long. 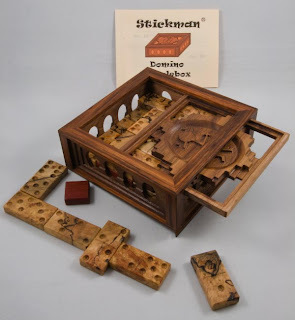 It takes 22 moves to open it and it’s not exactly challenging as a puzzle at all...you find the first side to move and then chase them round and round opening the four moving panels successively until the last one can move far enough to open fully. The workmanship on these little things is incredible though: when the box is closed there’s no clue as to which panel might move, and each movement is just enough to let the next panel slide just enough to let the next panel slide and so on...and they’re only an inch long!